Re-isssues of two gems of the greek dark sound scene from Lefki Symphonia. 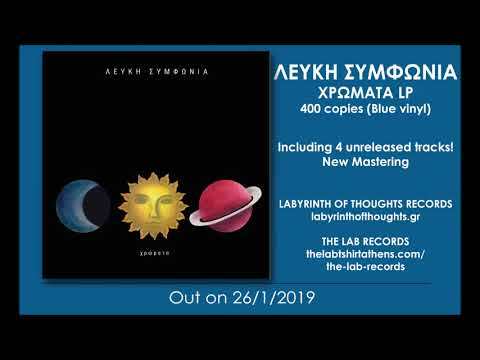 Both editions are remastered from the original analog master tapes from Nikos Stylidis of Labyrinth Of Thoughts. Artwork by Melanie Merges Dimitriou. The first album, titled ”Secret Gardens” was released in 1986 and is a landmark of the Greek 80s post-punk, new wave scene. A side contains an unreleased song from the album recordings titled “Melancholy” that completes the original first edition. “Colors” is the title of the fourth album of the band, originally released in 1996. This is a progressive rock record, with propably the best lyrics that band ever wrote. More complex compositions creating a melodic yet dark musical landscape, maybe their best effort until now. With 2 tracks that were not contained in the first edition of the album and two never before released tracks from the same period. Limited edition of 400 copies in blue vinyl.